Trump’s Cold-Snap Tweet Is Even More Shamelessly Stupid Than You Had First Thought. Here’s Why. As morning temperatures across the U.S. broke records Monday ― residents of Watertown, New York, woke up to minus 31 degrees Fahrenheit and temperatures plunged to minus 19 degrees in Des Moines, Iowa ― many other parts of the world were warmer than usual. Huge sections of the Arctic were among the areas that saw temperatures well above average, according to the University of Maine’s Climate Reanalyzer, which compares daily temperature anomalies to a baseline of data from between 1979 and 2000. 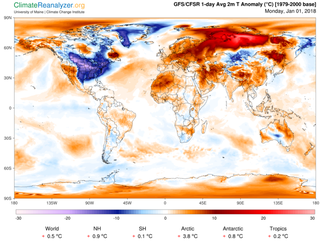 Temperatures around the globe were nearly one full degree Fahrenheit, or 0.5 degrees Celsius, above average on Monday. The Northern Hemisphere, which is currently experiencing winter, was 1.6 degrees F (0.9 degrees Celsius) warmer than usual. In Antarctica, where a Delaware-sized iceberg broke off last summer, temperatures were 1.4 degrees Fahrenheit (0.8 degrees C) higher than normal. And the Arctic, which is warming about twice as fast as anywhere else on the planet, started 2018 with temperatures 6.8 degrees F (3.4 degrees C) warmer than average. A peer-reviewed report released last month by the National Oceanic and Atmospheric Administration found that the Arctic is warming faster than at any point in the past 1,500 years, with 2017 its hottest year on record. Still, President Donald Trump ― who gutted environmental regulations and attacked efforts to reduce greenhouse gas emissions during his first year in office ― has seized on the cold snap in the northern Midwest and eastern United States in an attempt to refute the existence climate change. In a tweet on Thursday, the president conflated cold winter weather with climate, and suggested that the nonbinding Paris Agreement ― from which he announced plans to withdraw in June ― would cost the United States trillions of dollars. In reality, the U.S. contributed just $1 billion to the $100 billion Green Climate Fund set up under the Paris climate accord to help poorer countries invest in renewable energy and forgo coal-fired plants. “This one-week cold snap or two weeks, as it might end up being, isn’t going to change anything about any global climate signal,” Ryan Maue, an Atlanta-based meteorologist at Weather.us, told HuffPost. “What normal people are seeing right now when they look out of their windows is weather so cold that the very last thing on their minds is trying to prevent ‘global warming,’” he wrote. However, weather and climate are two different things. Weather describes conditions of the atmosphere over a short period of time, while climate denotes long-term trends in how the atmosphere behaves, according to a succinct summary that has been available on NASA’s website since February 2005. Sixteen of the 17 hottest years in NASA’s 137-year record have occurred since 2001. The warmest year on record is 2016, and 2017 is in second place.